*Note: If your organization is using SSO (single sign on) for user authentication, your login experience may be different. If you are having difficulty logging in using SSO or you are unsure whether your organization utilizes SSO for their Dude Solutions products, please contact your technology help desk for assistance. 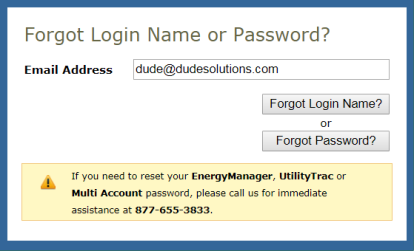 Open your web browser and type login.facilitydude.com into the address bar and hit the Enter key. Bookmark this page or create a shortcut on your desktop to make it easy to come back to this page later. Make sure that Work Order is selected in the product box. Click on the My Account link to go to your personal information page, where you can change your password or update your information. The Application Links drop down box is also in this section. If you are a user in multiple Dude Solutions applications, you can select the application from the list to jump between the different programs. Click the Logout link in the far right corner of the page to exit the system. The tabs at the top of the screen help you navigate to important areas of the application. Home - takes you to the Work Order home page. Calendar - takes you to the Calendar page where you can view outstanding or completed work orders by request date, target completion date, etc. New Work Order - where you can enter a new work order. Reports - takes you to a page with links where you can create reports. Account Setup - where you can set up certain aspects of your account. This tab is only available to Administrators. The Search For box under the Home tab can be used to find a specific work order or group of work orders. Enter a Work Order ID number to bring up that specific form or enter a keyword to bring up a list of work orders associated with that term. The Advanced Search link takes you to a more advanced search form where you can select multiple criteria to find the work orders you are looking for. The Help link on the far right will take you to a page that lists ways to contact our support team. The Actions menu contains links to Add information to your account, List the current fields, create Graphs, and run Reports. This center section shows you a breakdown of the statuses of all of the work orders in your account. Use the Period drop down box to narrow the time frame of the requests. The counts are based on the last status change date of the work order. Click on the number beside New Request or Unassigned to go to the Unprocessed New Request page where you will be able to assign out each work order. Click the number beside any other status to show a list of those work orders. Check the box next to the status to include it in the pie chart on the right. Unassigned - These New Request work orders are assigned to you for processing. 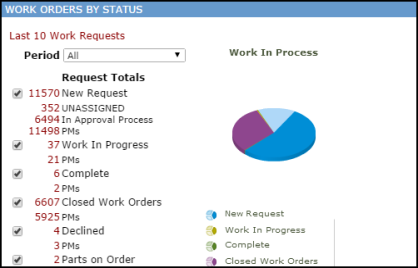 In Approval Process - These New Request work orders are waiting for the approval of someone other than you. The number of Unassigned New Requests and In Approval Process New Requests will add up to equal the total number of New Requests. PMs - This indicates how many of the New Requests were created in Planned Maintenance. The Assigned Work section of the home page will show a list of work orders assigned to you. 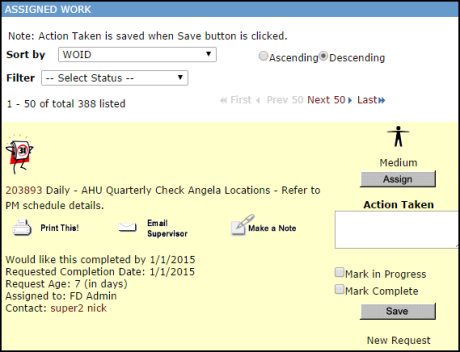 From this section, you can print the work order, reassign the work order, add action taken notes, and mark the work order as In Progress or Complete. You can sort the list by Request Age, WOID, Priority, Status, Location, Request Description, or Requested Completion Date in ascending or descending order. You can also filter the list by any open status. New Request - Shortcut link to enter a new Work Order request. Print WO Batch - Shortcut link to the Batch Print feature for work orders. Account Setup - Takes you to the same page as the Account Setup tab, where you can access the setup link only available to Administrators. My FacilityDude - Shortcut to the Requester page: www.myfacilitydude.com.